Today we had our follow up appointment with Dr. Nelson at Loma Linda. He looked at her x-rays and was very happy with how she's done these past three months. Her leg has corrected so much in such a short time. As of now she only has 5 mm left to correct in her femur! She's also grown 2 inches in three months, which means she's now 5' 2" tall! He said her big growth spurt helped her knee correct so quickly. So the plan now is to come back in three months to have the plate removed. We're waiting to be scheduled but it looks like it'll be at the end of September. Thank you all for the love and support, it means a great deal to us all. While you wait to be seen what do you do? Make silly faces of course! Here's an areial view of her legs. Amaya getting checked out by the resident. I'm always happy when there is female because it encourages Amaya that she can achieve her dream of becoming an orthopedic surgeon. Amaya was hoping she could get a coat like the "real doctors" wear. Here's a look at her current x-ray. You can see the eight plate and I could definitely tell her femur was straighter. We got to look at a model of the PRECISE lengthening device. This is what Dr. Nelson will use for Amaya's next lengthening. 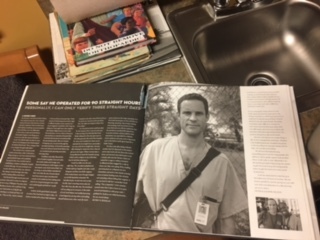 While we waited we looked through the book, Together We Move, we found an article on Dr. Nelson and the amazing work he did after the Haiti earthquake. He is an amazing surgeon and kind man. We are so fortunate to have him treating Amaya. Dr. Nelson got a good view of Amaya's knee and leg as she stood. He said that when we take her next x-rays she needs to stand this way (with her foot turned inward) so that he can get an accurate look at her femur. Today we saw Dr. Nelson for our yearly check-up. When he came into the room he laughed saying that if he saw Amaya somewhere else he wouldn't have recognized her since she's so big. After looking at x-rays from two years ago and comparing them to this years x-rays, watching her walk & run and manipulating her knee he said that he needed to correct the alignment in her left knee. He said her left knee is turning in more than the right one. You can see it when you look at her legs, but "more so" when you look at the x-ray. He said that its important to align the leg before she's done growing and before she begins her next lengthening surgery (also about 14 years old). He said that ideally the eight-plate is completed a year before kids are done growing. Girls typically finish growing at about 14 years old. So the eight-plate should be started at age 11 & 1/2 to 12 to be complete by age 13. 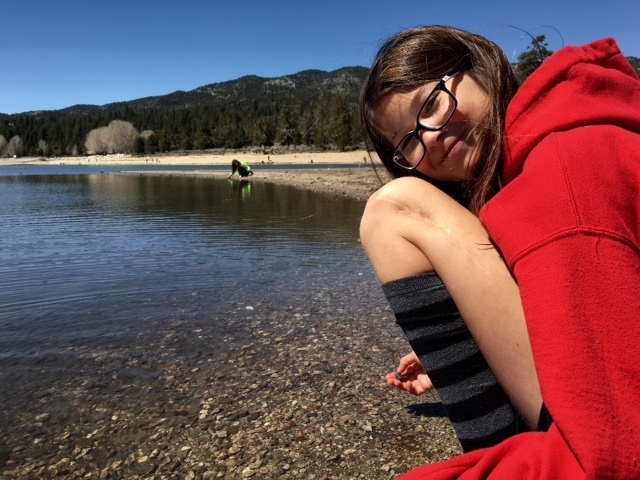 He said the latest we could wait to do the surgery is six months from now (Amaya is 11 & 1/2 now), but since we're moving to Northern California this summer he said we should do it ASAP. That way he can monitor her as much as possible while she's still here. The soonest date was March 30th. We did our pre-op paperwork today, so we are officially scheduled for surgery. The week of the surgery we'll have a consultation with the anesthesia department and then do the pre-op appointment the same day as the surgery. Dr. Nelson also said that her left leg is now 7 mm (about a quarter inch) shorter than her right leg. Last year the difference wasn't noticeable. We will keep monitoring it to see how she continues to grow and when to schedule her next lengthening. He thinks it'll be around age fourteen or once she's done growing. Using a small incision (about an inch to two and a half inches) Dr. Nelson will place an eight plate on her left knee. The plate is held in place by two screws. The plate helps by guiding the growth of her bone to naturally correct the alignment. The surgery is outpatient, and takes about an hour to perform. Amaya will be asleep during the surgery, so once she wakes up and recovers from anesthesia she'll be able to go home. Dr. Nelson said that compared to her other surgeries this is easier and a "small" surgery. She won't need a wheelchair or walker for this surgery. She should be able to walk and bear weight in about a week or so. The eight-plate will be in for about 6 months depending on how her leg responds. Every three months Dr. Nelson will order x-rays to see how its doing then decide when to remove it. but Amaya's will only be on her femur). Thank you all for the love and support. This surgery is coming up quickly (only three weeks away!). Amaya is a bit anxious, but is open and honest about her feelings and we're walking her through the process and her emotions. We're also gathering information for her (she's curious and nervous about the incision size, scars, recovery time, pain, anesthesia, etc). Thankfully our PFFD friends are sharing their experiences and photos with us. Amaya is so sweet! She bought me a treat and wrote me a card to thank me for taking her to all of her appointments and for all my "support." Tuesday morning we had Amaya's last physical therapy session!Woohoo! No more three hour round trips to and from therapy! No more leaving school and work midday, or leaving early or coming in late! No more dealing with traffic! No more therapy! Well, that's not entirely true. Although we won't be going to therapy anymore Amaya still needs to continue with the exercises at home. She will continue to do them every day until she has her knee surgery (in about 3 & 1/2 years). She has seven exercises on her routine to do (some she does on both legs, some just on her left). The therapist suggested splitting them so she has two different exercise routines to do. She'll alternate them every other night, that way she doesn't get too tired each night or worn out. Therapist-Do you ever not have pain? T-What is your pain level when you're resting? A-"It's usually achy, but gets sharp with walking, lunging, squatting, etc." T-Are you still using medication? A-"Yes, but only about once or twice a week"
T-How long can you sit before you feel pain? T-How long can you walk before you feel pain? T-How much pain do you feel when you do leisure/recreational activities? Like basketball? A-"It's a little easier sometimes, but pain is about the same." Then we moved to the physical assessment. She had Amaya stand, walk, step up and down, sit, squat. The therapist pointed out that Amaya favors her right leg (she leans toward that side). She said it may just be a bad habit, but hopefully as we continue with the exercises Amaya will improve and won't do that anymore. The therapist did point out to Amaya that she corrected it pretty quickly on her own, so perhaps Amaya is "getting" it. Her increased strength and awareness are helping and will continue to do so. She didn't asses Amaya's range of motion (ROM) because, "it was never an issue. It's normal. Well actually, it's amazing!" Her ROM is minus 10 to 155. She said that's better than most people without leg issues. And in the PFFD post lengthening world, that's very amazing! The therapist tested Amaya's strength and saw some improvements. She said that the pain isn't as good as we had hoped (didn't decrees as much as she had hoped it would have). But she was optimistic that it would continue to as Amaya continued to work on her exercises. She said, "its a long term goal." So definitely something we have to keep working toward. The therapist commented that Amaya's alignment is pretty good, especially when she does her exercises. She recommends wearing her knee brace more often. She said long term the best thing is increasing her strength. Jennifer was very helpful and gave us a great plan to follow. She reminded us that the typical physical therapy cycle goes like this: patients go to therapy because of pain, but stop once the pain decreases or goes away. Then the pain returns. Then they return and begin doing exercise again, but later stop. And another cycle begins. She said she's pretty confident Amaya won't do that because she does so well doing her exercises nightly, has improved already and has a good support team. As for us, we've got some work to do. Amaya needs to keep doing her nightly homework. I need to help her with her stretches (checking alignment, increasing weights as needed, monitoring her reps and growth, rotating exercises, etc). Amaya has done amazing through all of this. Never complained, never whined, never threw a pity party. She said she knows the exercises will help her so she does them. She was hoping to have an end dat etc when she could stop her exercises, but understands the need to keep doing them and dint complain about it. Me and my sweetie at her last appointment. Terrible picture, but she's doing weight lift shoes. Stepping on the step in her Darth Vader long socks. New exercise- side leg lifts. This girl loves tights and long socks! Here's her doing more leg lifts. In more long socks! Amaya lunging and stretching in her cool Starry Night long socks. In school Amaya had to do an "I'm an Expert Project." She decided to do it on limb lengthening. It came out really well and I'ms o proud of her. I've posted it below for you. Here's what her poster board and display looks like. She'll be giving her eight minute presentation Monday. Lengthen means, "make or become longer"
2400 years ago Hippocrates described a form of lengthening that used Egyptian leather. In the 1840's Jean-Francois Malgaigne described using a spike and a claw-like device to treat a fractured tibia. The first successful lengthening was performed in 1905. During the 1930's several people from different countries worked to improve lengthening devices. In 1954 Gavril Ilizarov, a Russian orthopedic surgeon, invented a new lengthening device called the Ilizarov fixator. Later in the 1980's Dr. Frankel brought it to the US. In 1990 Dr. Paley began using the lengthening over nail (LON) procedure. Lengthening has improved greatly and continues to do so. Currently there are three types of lengthening devices used. What Is Lengthening Used For? Lengthening can be used to help many people with many different conditions. Limb lengthening treats dwarfism, polio, hip deformities or congenital limb defects (including limb length discrepancies). It also treats people who have suffered traumas, broken bones or growth plate injuries. People who are at risk of amputation can also benefit from limb lengthening. The lengthening process has four steps. The first is surgery (the leg is cut open, the bone is broken, the lengthening device attached). The second step is the distraction phase. The third step is the consolidation phase. The last step is the removal of the fixator. The process can take up to 6 months to a year. Using a lengthening device bone is pulled apart to increase the patient's height. New bone and soft tissue (nerves, muscles, skin, blood vessels, etc.) are grown. Because bones are living substances, when pulled apart new bone is created in the space in between. Lengthening is a two part process. The first stage is the distraction phase. This is the lengthening phase. During this phase the bone is pulled apart at a rate of 1mm per day. If it is pulled apart too fast it will fail because new bone may fail to form and it might damage the muscles and/or nerves. 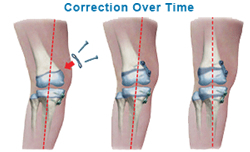 If its pulled apart too slow then the bone may harden too soon preventing further lengthening. The most that you can lengthen at one time is 8 cm (3.14 inches). The second stage is the consolidation phase. After you’ve met your lengthening goal then you can begin consolidation. The new bone is weak and has a lack of calcium. 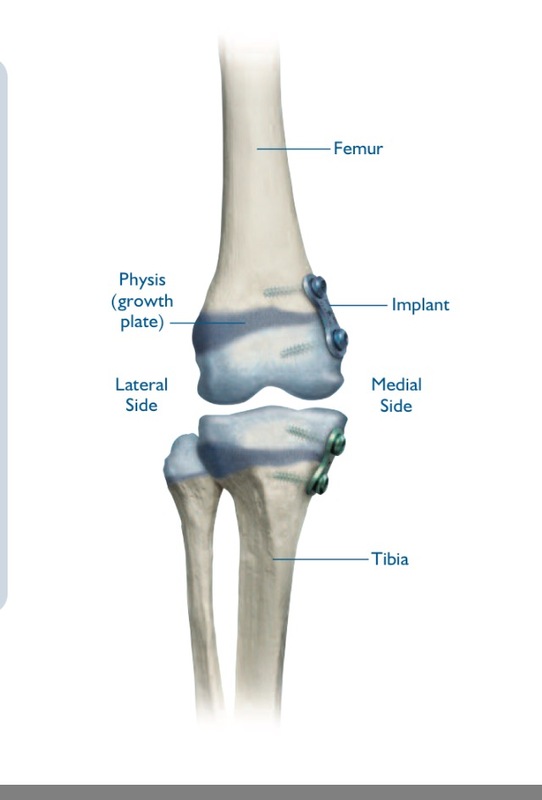 During the consolidation phase the new bone is allowed to get hard and strong and calcify. A fixator is a device providing rigid immobilization through external skeletal fixation by means of rods attached to pins that are placed in or through the bone. There are two types of fixators. External fixators are devices that attach to the bone through wires and pins. The external fixator looks and acts like a scaffolding, supporting the separated bone. The fixator mechanically lengthens the limb by pulling the segments of bone apart. There are two types of external fixators: monolateral (e.g. the Modular Rail System) and circular (e.g. llizarov device and Taylor Spatial frame). I was born with Proximal Femoral Focal Deficiency (PFFD). That means my left leg was shorter than my right leg. When I was six years old I had my left femur lengthened to match my right femur. 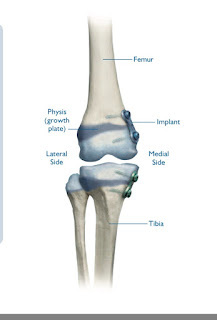 My orthopedic surgeon, Dr. Nelson, used an external monolateral fixator for this procedure. After separating my femur into two parts, he attached the fixator to my left femur and tibia to stabilize the bones for growth. I wore the fixator on my left leg for eight months. Every day, for three and a half months, we turned the rod four times a day. This slowly moved my femur bone apart as it grew new bone. Each turn was .25 mm, totaling 1mm of bone growth a day. After lengthening we left the fixator on while the new bone solidified and healed. I had to go to physical therapy for an hour a day, 5 days a week, for 11 months. I also had physical therapy homework to do. The therapy helped grow soft tissues (muscles, skin, blood vessels, etc.) to match my bone growth and not damage my knee. I missed a lot of school through this process. I used a wheelchair and a walker for about a year. Lengthening was a painful process. The most painful was the daily pin site cleaning. The pins are the metal bolts that attached the fixator to my leg. They are actually large bolts that were screwed into my bone! It was important to clean them daily to avoid infections in my femur and tibia. I'm glad I had the lengthening done because it made my leg better. I grew three inches of new bone by the end of the lengthening! I no longer have to use a shoe lift, which helped with my balance and ability to run. I will have another lengthening done in about two to four years, depending on how my leg grows. My next lengthening will use an internal device called the PRECISE Device. This technology will make the lengthening procedure easier, as the fixator will be inside my bone and not on the outside of my leg.